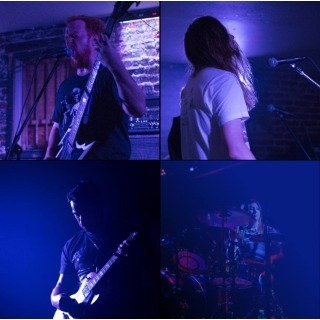 Garbeast is an LA-based #sludge #metal #band steeped in atmospherics and volume-creating #riffs that crash along the broken glass-littered shores, #keyboards that spread and infect the hillsides like wildfire, and a #rhythm section brutal enough to register on the Richter scale. When drawing and analyzing Garbeast’s blood, a direct line can be seen that points to the elder gods, such as Black Sabbath, Pink Floyd, and King Crimson, and to the modern masters of Neurosis, Intronaut and YOB, with many others #mixed in to create the unique cocktail that is Garbeast. Garbeast does not #sound like any one thing, but rather a unique amalgam of many #influences and #genres that end up resulting in an #atmospheric sludge with dashes of 70’s prog rock, doom, and post-metal. Garbeast is Felicity on Drums, Shaun on Bass/Vocals, Colin on Synth/Vocals and Ryan on Guitar.